A recent Pinterest-inspired recipe that we decided to try was a recipe for Sloppy Grilled Cheese sandwiches. We modified the recipe a bit to turn it into BBQ Sloppy Texas Toast Grilled Cheese sandwiches, haha. It was…decadent and I ate two, which, five hours later, was still one too many, haha. Essentially, Jay made BBQ sloppy joes (we use a modified recipe that we originally got from Blue Apron last year) and I went to the store and bought American cheese and garlic Texas toast and then put them in the toaster oven, lol. This was our “quick” way of making them, but if you’re adventurous with better taste buds, then you probably want to compile them the old-fashioned way of butter on two slices of the bread and cheese of your choice and grill/press them together over the stove. Anyways, they were pretty tasty, if not a million calories, lol. Here’s the recipe we used. Feel free to adjust the amounts to your taste/portion needs. Make the sloppy joes – brown the ground beef in the skillet. Add the onions and drain the grease. Add in the barbecue sauce. Cook low or simmer. Make Texas toast – Butter each side of the bread and place the cheese on it. If you’re putting it into the toaster oven, wait until it’s toasted. If you’re grilling it in a skillet over the stove, keep an eye until the bottom sides are a golden brown. 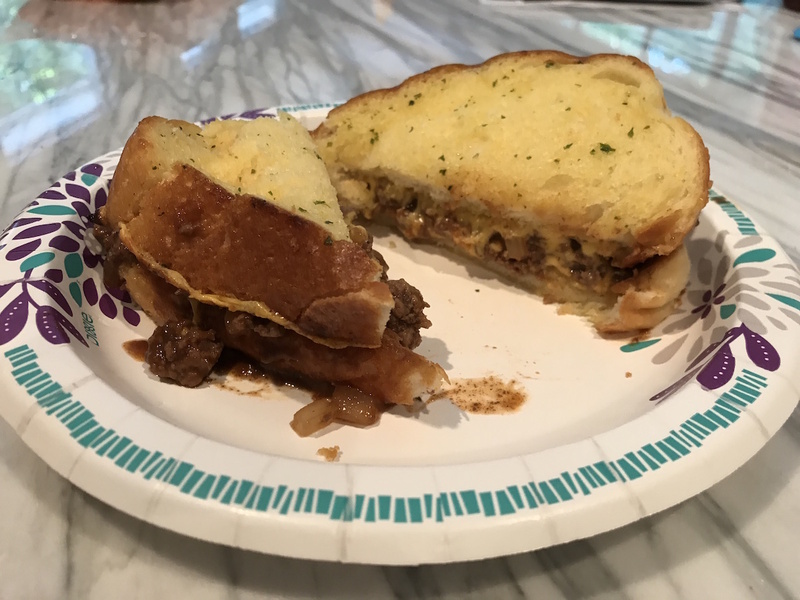 Assemble the sandwiches; if you were cooking over the skillet, you may want to put the sloppy joes on one side while it’s in the skillet and put the other piece of bread over it and melt them together. Yummy!